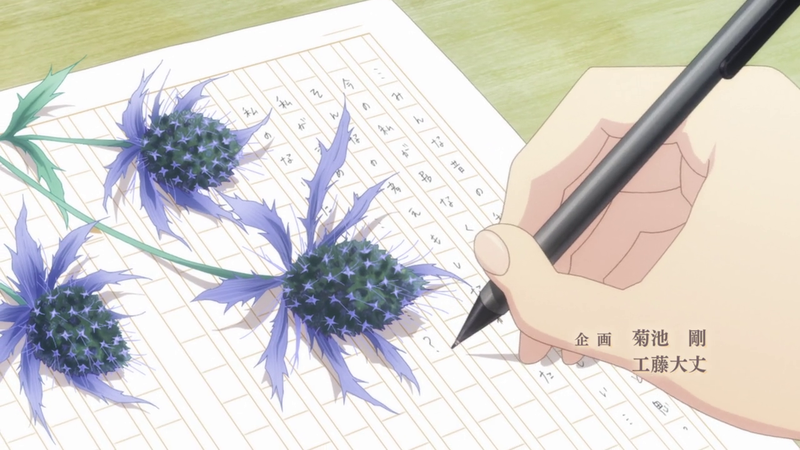 The first focus flower to appear in Bloom Into You‘s opening sequence is a sea holly, draped over a piece that Yuu’s friend Koyomi is writing. Sea holly (or eryngium) flowers are ornamental plants that resemble thistles and are said to represent admiration, independence, or austerity. 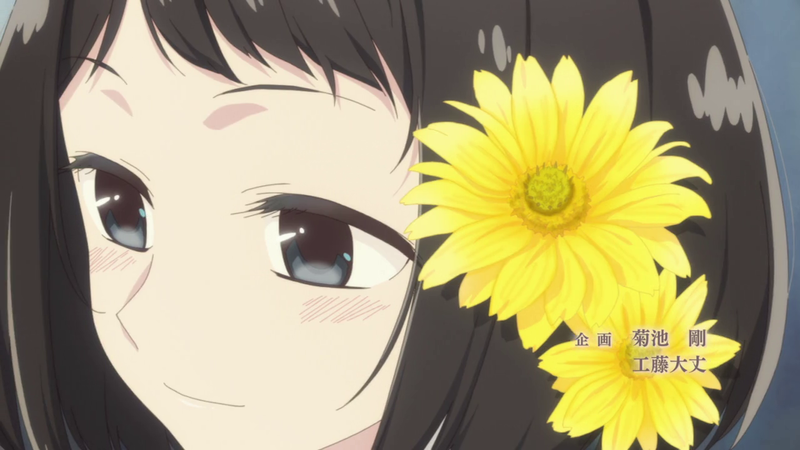 Koyomi’s second flower appears to be a yellow gerbera daisy, which symbolizes cheerfulness or happiness. A gift of gerbera daisies often means that the recipient should allow happiness to guide their way. 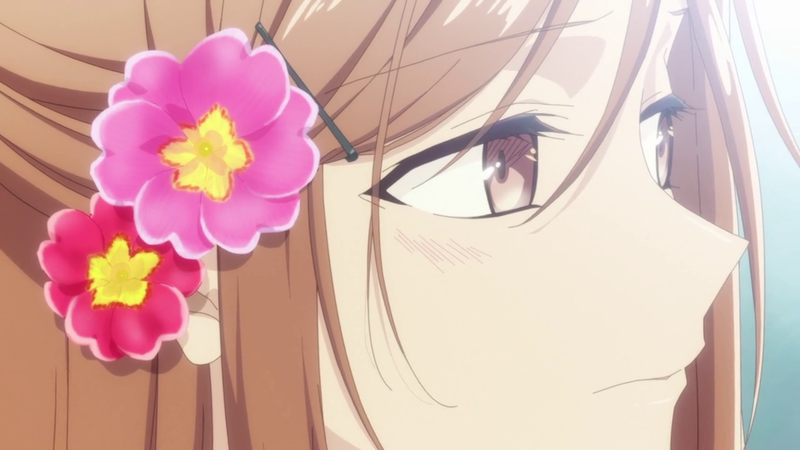 These flowers are pinned in Koyomi’s hair. Beyond her love of reading and writing, we know the least about Koyomi. Her gerbera daisies and sea holly flowers expand on what little we’ve been shown of her perspective. Koyomi is independent (sea holly) first and foremost. Unlike her closest friends Akari, who is on the basketball team, and Yuu, who was dragged into student council activities thanks to Yuu’s inability to say “no” and a developing relationship with Touko, Koyomi keeps to herself and pursues a solitary activity. We discover along with Yuu how serious Koyomi’s dedication is when she gives Yuu her finished manuscript. A flower like the gerbera daisy that represents continuing on a path that makes her happy suits Koyomi because Koyomi already has a love of writing, and is in the process of seeing if she can turn it into a potential career. Due to the myriad color combinations available, anemone flowers have a variety of meanings that include everything from sincerity to omens of death. Red anemones in particular are associated with an accompanying tale of Adonis and Aphrodite — the red in the flower represents Adonis’ blood as he died in Aphrodite’s arms. A red anemone specifically carries the meaning of a forsaken love or a love separated by death. 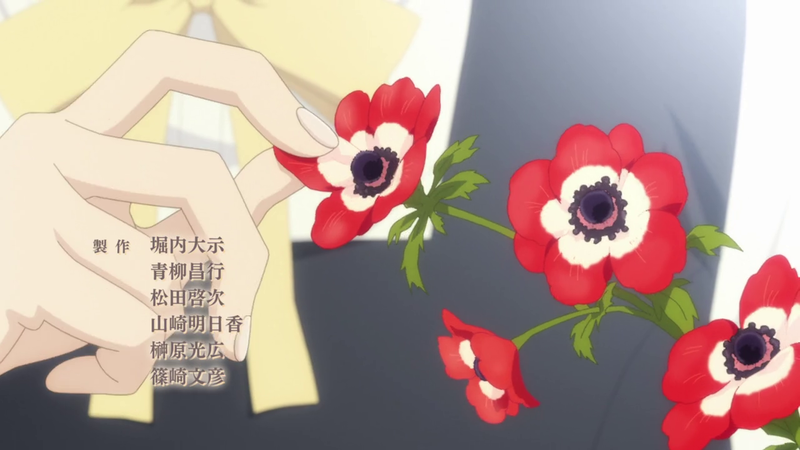 Although death (as far as we know) doesn’t enter the picture, tying Yuu’s close friend Akari Hyuuga to red anemones in the series opening says a lot about Akari’s rejected confession. Akari admits in the third episode that she already confessed and was rejected by a senior basketball member she had liked for a long time. While Akari brushes it off, saying that he said he wanted to focus on basketball rather than an outright rejection of her feelings, Yuu thinks about how Akari’s words sound practiced, as if she’s trying to convince herself that there’s still an opportunity. 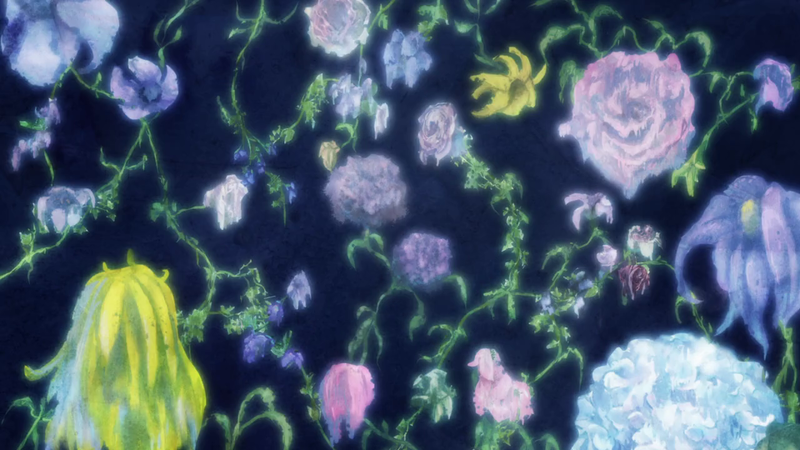 Akari’s second flower is similarly inauspicious for her romantic intentions: the primrose. Primroses have a meaning of young love, but can also carry sentiments of desperation or the inability to live without someone. Unlike Koyomi’s flowers, which foreshadow happiness, Akari’s seem to spell doom for a relationship with the person she likes despite her dedication. 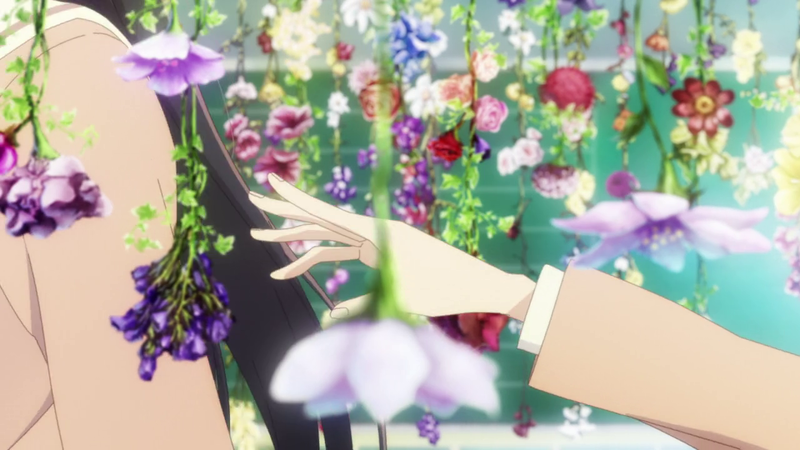 Through conversations with both Touko and Yuu, furtive glances at the two while they’re together, and her childhood friendship with Touko, we can guess at Sayaka’s emotions and intentions; however, the flowers she’s given in Bloom Into You‘s opening make those more clear. First, there’s the obvious actions in the opening. 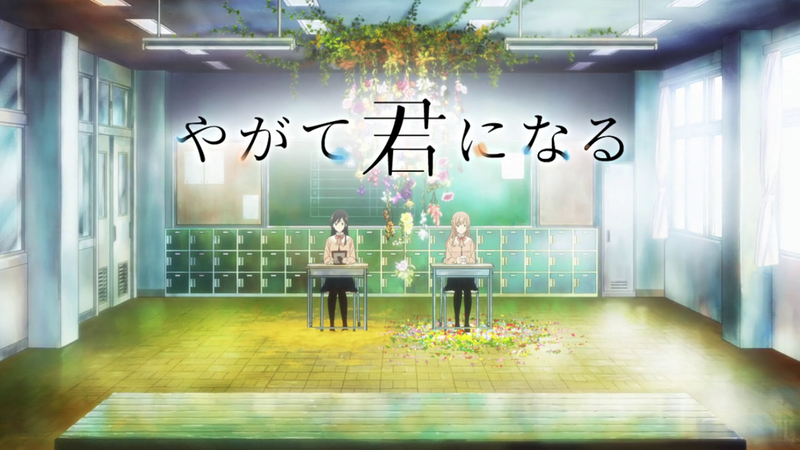 Sayaka reaches out to Touko through the hanging flowers only to have Touko walk away, just out of reach. These flowers then appear by themselves, and in the next frame are completely wilted. This hardly bodes well for Sayaka’s feelings, and additionally could foreshadow ill intent on her part towards Yuu and Touko’s developing relationship, although this could be going a bit too far. Sayaka certainly doesn’t seem supportive, and definitely feels left out or cast aside, but she also doesn’t appear to bear a lot of ill will towards Yuu. She even goes as far to point Yuu in the right direction regarding Touko’s past. 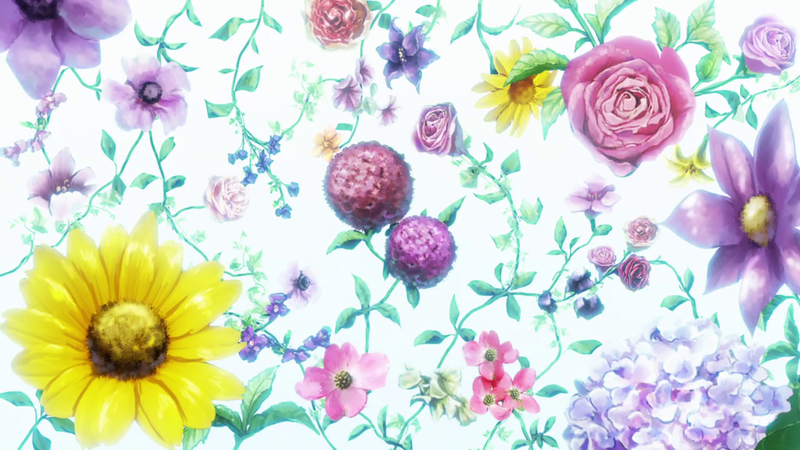 There are a lot of individual flowers shown in relation to Sayaka starting with the cheery yellow sunflower in the lower left corner of the flowers that wilt. Sunflowers have a lot of different meanings — positivity, happiness, and long life are the most common — and in Japanese hanakotoba specifically, they mean a passionate love, radiance, and respect. Sayaka’s feelings for Touko are obviously strong and have been forged through years of friendship. As Sayaka tells Yuu somewhat condescendingly, Yuu doesn’t have to worry about Touko because Sayaka will always be there for Touko regardless. Nearby is a four-petaled flower that appears to be a flowering dogwood. Dogwood flowers have strong religious symbolism tied to Christianity, rebirth, and resurrection. In Victorian flower language, a dogwood flower was given as a token of affection. If it was returned, then the giver’s feelings were not reciprocated but if it was kept, then there was a mutual attraction. We still don’t know if Sayaka’s feelings are romantic based on what has been shown in the anime, but Sayaka’s flowers, including the dogwood, suggest romantic intent, even if she doesn’t express it outright. Pink peonies are present, standing for beauty, romance, honor, and bravery. There’s also a variety of pink, purple, and white roses which can mean admiration, gratitude, romance (pink), royalty, mystery, and attaining what was thought to be impossible (purple), and innocence, silence, devotion (white). What appear to be purple anemones could symbolize protection and anticipation. 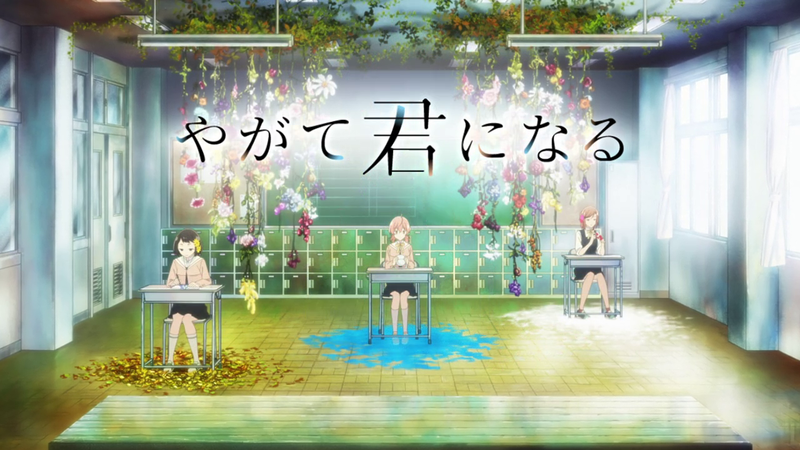 The hydrangea plant at the bottom right is a common flower in anime and is a symbol of pride. Purple pansies represent romantic devotion, that a person is thinking constantly of another, thoughtfulness, and caring, especially when it cannot be expressed aloud. Striped white and purple petunias symbolize fantasy, charm, or enchantment, but the petunia flower specifically — depending on the situation in which it is given to another person — can mean anger or resentment towards that person. The most important context for Sayaka’s many flowers is her action of reaching out towards Touko only to be left behind. Her flowers immediately wilt. There’s a lot more to Sayaka than we’ve been shown in the six episodes available. Sayaka’s flowers tell us of her love for Touko as well as her silence and inability to express those feelings despite watching over her for years. I was hoping someone would look at the flowers and their meanings in this because I can’t really tell flowers apart but I was curious. Thanks for sharing.